Dawn Mello, the great retail fashion director who revived the staid, unprofitable Bergdorf Goodman and resuscitated the moribund Gucci, is the subject of a new book titled Dawn. Published by Pointed Leaf Press and written by John Tiffany, it includes many remembrances and anecdotes from fashion designers who Miss Mello, as she was called, discovered, cultivated and promoted. Located at the foot of Central Park at Fifth Avenue and 58th Street, Bergdorf Goodman had catered to the elite carriage trade of Fifth Avenue but then began to lose its luster. In 1975 Ira Neimark was brought in as President and CEO of Bergdorf Goodman, and he hired Dawn Mello, a colleague, to be the Fashion Director. Together they set about to recreate Bergdorf Goodman. Ira Neimark, 97, just passed away this week. I interviewed him once and he was as charming as you can imagine. At a time when Pauline Trigere was the top American label in the store, Dawn Mello sought to elevate Bergdorf Goodman and bring energy to the store first with the new Italian designers, including Fendi, Krizia, Gianfrance Ferre and Giorgio Armani. The French followed -- like Claude Montana, Azzedine Alaia, Jean Paul Gaultier and the super-star of the 80's, Christian Lacroix. Then came the Americans including Geoffrey Beene, Oscar de la Renta, Calvin Klein, Ralph Lauren, Michael Kors and Donna Karan. Bergdorf Goodman became the most fashionable store in the world. In 1989, Dawn Mello left Bergdorf's and went to Gucci in Milan as Creative Director. She was hired to rebuild the over-exposed, once luxurious Italian brand Gucci by Maurizio Gucci, who in 1995 was gunned down by a hit-man hired by his ex-wife Patrizia Reggiani. In New York, Ellin Saltzman from Saks Fifth Avenue replaced Dawn Mello at Bergdorf Goodman. At Gucci, Mello hired a young American designer named Tom Ford. Together they restored the historical brand with a new, modern, clean style. In 1994 Mello left Gucci to return to Bergdorf Goodman in New York and Tom Ford was promoted to Creative Director at Gucci. We know that worked out well! At the party, Michael told me a good story about when he was a fashion student. "I was working at the Lothar's store across 57th Street," he said. "I was the display guy working in the window. Dawn knocked on the window and said, 'Who designed these clothes?' and I said, "I did." She said, "Oh I thought you were the display guy," and I said, "I am." She said, 'When you are ready come over and see me." I did and here we are 37 year later." "She had great taste but she also had a great empathy and understanding of the woman who was the Bergdorf Goodman customer," Kors said in explaining Mello's success as a retailer. "When I showed her my line, with the third piece, she said, 'We'll take it.' It's heaven when you have someone who understands their customer." Linda Fargo, Bergdorf's Fashion and Creative Director, who Dawn Mello hired to work on window displays, was in attendance as well. "She changed the face of American luxury retail and changed the face of Bergdorf Goodman and a lot of the lives of the people who are in this room tonight," Linda Fargo told me. "She really was a divining rod and had an eye for talent and then nurtured it." This book pays tribute to an important retailer who shaped fashion in her time, and was devoted to beauty and style. Yours truly in front of Andy Warhol's colorful silk screen of art collector Ethel Scull. TD and I headed over to the Whitney in the Meatpacking District to see the Andy Warhol retrospective up until March 31. I think the new Whitney is great; I like it much better than the old Whitney uptown designed in the brutalist style by Marcel Breuer. The new version created by Renzo Piano is lofty and airy with super-high ceilings, and the gallery walls can be reconfigured for each show. The Warhol exhibition takes one whole floor and it's spaciously mounted. I found the show to be very interesting and surprisingly serious. I thought it would be more colorful and jazzy and celebrity-driven since Andy was best know for his portraits of famous people - Liza! Liz! Farah Fawcett! But this show was toned down and quite rigorous as it explored Warhol as an artist. One also got the sense of what a hard worker Andy Warhol was as he produced art works, films, tv shows and Interview magazine. I think I was expecting more razzmatazz because of The Andy Warhol Diaries, the very entertaining book that was published in 1989 following Warhol's unexpected death in 1987. Andy was out on the town socially in New York City practically every night and at the end of each night he dictated notes to a friend. He was a sharp observer and the book is an amusing account of New York in the '80s with appearances by Halston and Liza and Mikhail Baryshnikov, etc, etc. Andy talks about how hard he worked to get commissions for those expensive portraits which kept his whole operation running. I, incidentally, am a big fan of diaries - Leo Lerman's diaries called The Grand Surprise is wonderful, and Tina Brown's The Vanity Fair Diaries is wickedly humorous. I personally did not know Andy Warhol as others in New York did though I did see him out at the night clubs Area and Palladium. The exhibition includes a big painting with "Paramount" splashed across it and notes that it may refer to Andy's boyfriend Jon Gould who worked at Paramount when Barry Diller was running the studio and hiring handsome men. When I worked for a small magazine company my boss was Katy Dobbs, whose best friend was Jon Gould. They had met at the summer Radcliffe Publishing Course. I remember seeing him a couple of times - a super-chic man. Jon Gould died of AIDS. Katy spoke at his funeral and said it was the hardest thing she ever did. Then Andy passed away in 1987. That was a shock. He went into the hospital for a routine gall bladder operation and died the following morning. It was one of those moments when you hear the news about someone and remember exactly where you are standing - I saw it plastered across The New York Post at the neighborhood corner magazine store. Besides being a prolific artist, he was a great connector of people in New York and it was a big loss for the city. Now with this exhibition at the Whitney, Andy was gotten his due. 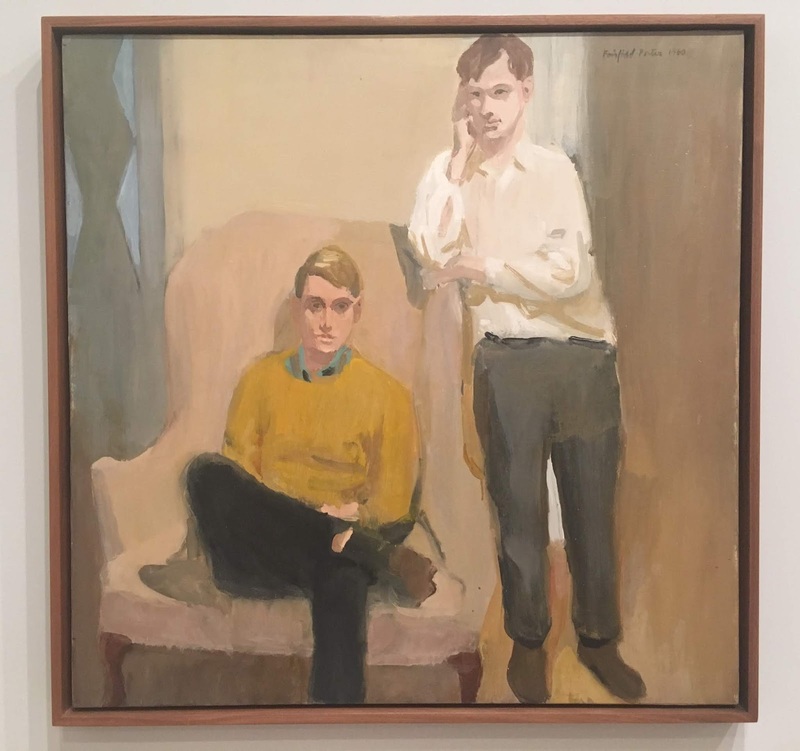 One of the favorite things I saw at the museum was on another floor - this portrait of Andy Warhol on the right with his friend Ted Carey painted by Fairfield Porter from 1960. Ted Carey also died of AIDS. I love the easy elegance of Fairfield Porter paintings and how this portrait captures a young Andy Warhol before all of his big success. Writer Emily Evans Eerdmans (center) speaking at the event. Now that's what I call a memorial service. On Monday night I was invited to attend a celebration of the remarkable life of American decorator Mario Buatta who passed away in October. The event was hosted by Emily Evans Eerdmans, Patricia Altschul, Anne Eisenhower and Hilary Geary Ross, and held at the Park Avenue Armory where The Winter Show (previously called The Winter Antiques Show) is now in session. Mario is an old pal who Ted and I had known for years. Besides his talent for creating beautiful rooms inspired by the English country style, he was indeed a larger than life character with an ebullient personality and a mischievous sense of humor. When Mario received an honor from the New York School of Interior Design, we did a video interview with him on the blog - you can watch it here. On Monday night it was 11 degrees out, RealFeel negative 9, or something like that. I bundled up and headed uptown. When I arrived the place was already packed! There must have been 300 people already sitting on gold gilt chairs so it was standing room only. I stopped at the bar for a glass of red wine to fortify myself. A man said to me, "Mario would have loved this." I inched through the crowd and secured a place to stand along the back wall where I noticed how beautiful the renovated, ornate Veterans Room is with its carved wood paneling and green-painted walls. Glass globes holding lights dangled off of exotic metal chandeliers overhead. The program began with a tv interview with a younger Mario. Then there were nine speakers in the program, commencing with Mario's friend Hilary Geary Ross. The pretty and blond Ms. Ross noted that Mario and she "were like brother and sister though he always introduced me as his mother." I think every single speaker mentioned Mario's insect gag which I witnessed myself one day when we went to a lunch at the Sherry Netherlands Hotel. Suddenly on the white linen cloth was a big, ugly, brown cockroach jumping across the table. There were shrieks all around, but the cockroach was a plastic fake on a fishing wire tugged by Mario himself. His cousin Anne Newgarden reminisced about growing up on Staten Island with Mario. Designer Christopher Spitzmiller recalled how Mario told him his pants were "like a cheap mansion - no ballroom." Editor David Patrick Columbia observed that though Mario was fun and jolly, there was a darker more complicated side to him and I think that is correct - Mario talked to me about being single and his frustrations with dating. Towards the end of the event a diminutive lady in the back row stood up and left her seat - I thought she might be looking for a restroom. But she walked to the front and picked up a microphone and started singing; it was the great cabaret performer Marilyn Maye who then offered moving renditions of "Secret of Life" and "Here's to Life" followed by loud applause. It was one of those moments when you think, "New York is so amazing." After the event was over, it was back out into the cold night but the warm affection that was in the room stayed with me. It was a lasting tribute to Mario; indeed he would have loved it. The holidays are upon us (how did that happen!) and it's time to get out the Christmas decorations. We always enjoy the tradition of buying our Christmas tree from Billy Romp on Jane Street. We pick out the tree and Billy delivers it and we sit and have a glass of wine and catch up on the year. Our Christmas decorations are largely white and green with a little pale color; it's soothing and calming. 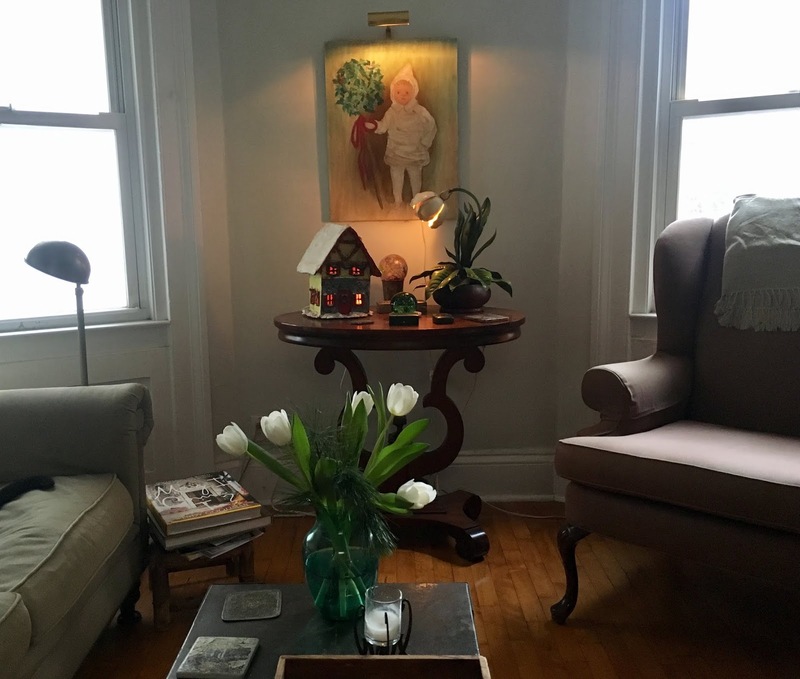 At the end of living room we have an Empire table that belonged to my great grandmother in upstate New York. At Christmas it gets a holiday make over. Holidays bring up a lot of memories and this table is loaded with them. In Utica, New York, my creative mother liked to go to our museum, the Munson Williams Proctor Art Institute, where members could borrow paintings on a rotating basis. When I was a boy I enjoyed going with her and we would thumb through the available paintings. At Christmas she chose holiday scenes but one year she decided to paint her own. This was from a postcard or picture she saw, and it's sweet with a green and white scheme, and red ribbon and holly berries. 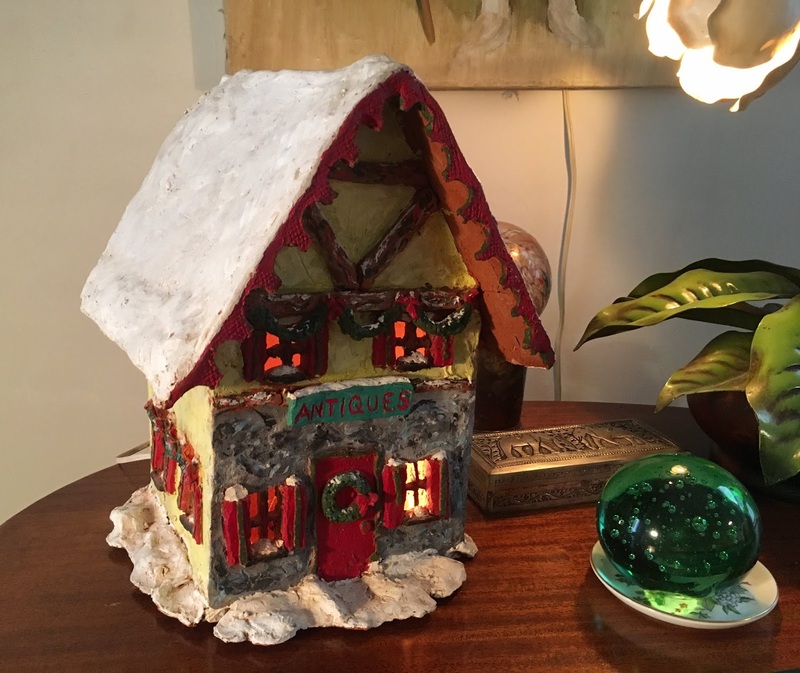 I can't remember where I got this idea but I made it in my high school art class, building the house out of clay, firing it in the kiln and painting it, complete with an "Antiques" sign over the front door. My father put a little light bulb inside it and my mother got it out every Christmas. When my parents passed away their home was emptied and this gingerbread house was left behind but my very smart sister-in-law Tracy rescued it for me for which I'm very grateful. The table was itself, I was told, given to my great grandmother, Bessie Crinnion, and great grandfather, Dan O'Donnell from Sligo, Ireland, on their wedding day in 1886 at 611 West German Street in Herkimer, NY. I really like its shape and how you can see the silhouette of it at the end of the room. On top of it sit other gifts and favorite objects. My great grandfather Dan O'Donnell was a railroad engineer in Herkimer and we have his big wooden tool chest on an adjacent wall in the living room, also in a dark brown color but it is rough and rugged. I like how my great grandparents' pieces are similar and different. I hope you are enjoying the season and I am wishing you and yours very happy holidays, merry Christmas and a happy new year! 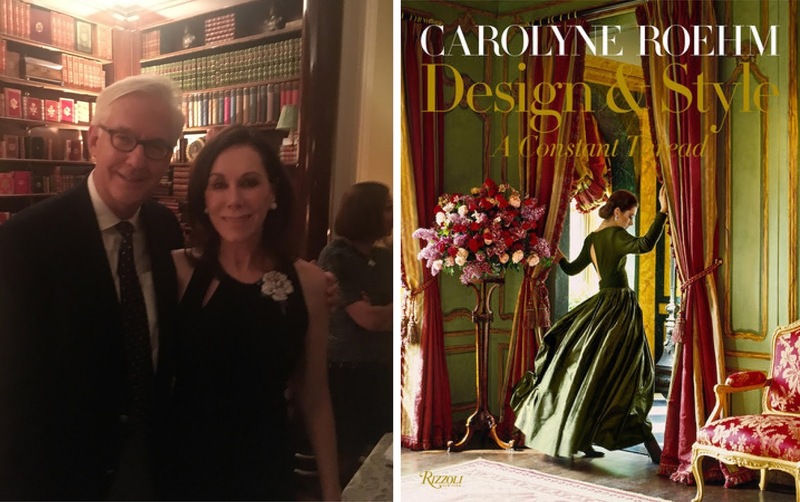 With Carolyne Roehm at her book party in Susan Gutfreund's Fifth Avenue home, and the cover of her gorgeous new book. 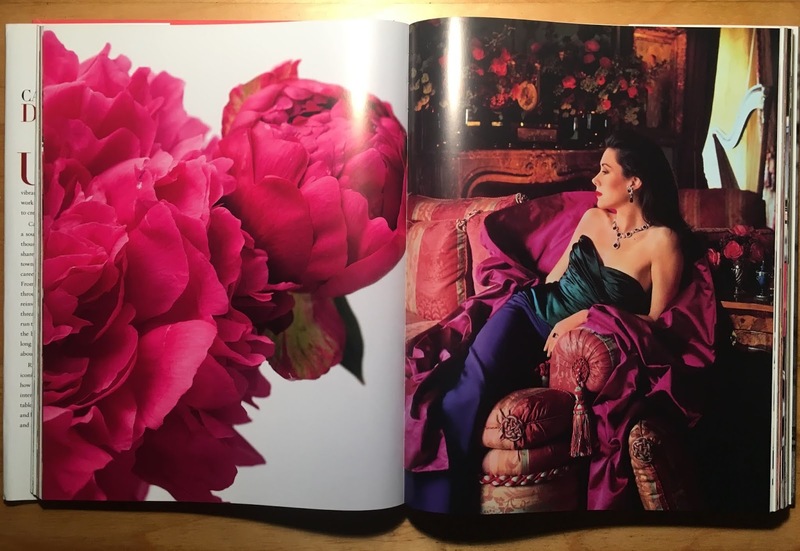 Carolyne Roehm, a longtime friend of this blog, has a new book out called Design & Style: A Constant Thread. Besides being impressively large and heavy (you could do bicep curls with this thing), it's unusual for Carolyne, who has produced twelve books, because this one is largely autobiographical. We caught up with Carolyne a few years back at home and did two video interviews on the blog when she published her book A Passion for Interiors. Her living room, with its double height ceilings and brown velvet walls, is I think the most beautiful I've been in. Two years later we did a video with Carolyne in the New York City flower district for her book Flowers. For this book, Carolyne's friend Susan Gutfreund hosted a party in her renowned apartment on Fifth Avenue, and that was a real treat. The Fifth Avenue building was designed by architect Rosario Candela, who I recently wrote about for Architectural Digest. 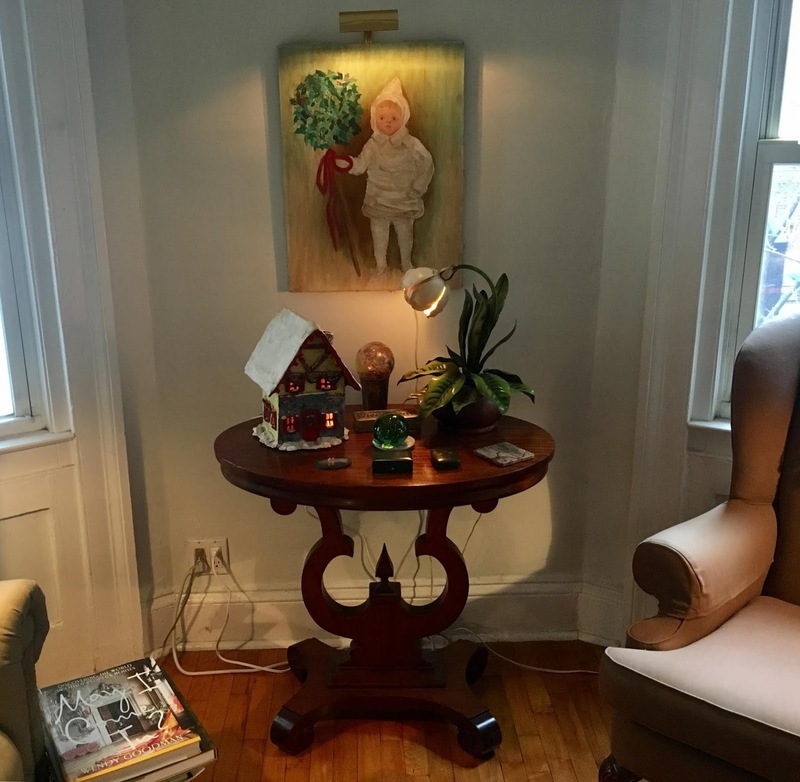 The stunning apartment was decorated by Henri Samuel, who was the subject of a book by Emily Eerdmans Evans, which I wrote about here on the blog. Candles flickered in the long salon facing Fifth Avenue where the party was held, and we had the chance to duck into the celebrated Winter Garden room, which is decorated in tones of yellow and green and pink. Carolyne is dedicated to beauty and her books have been about her expertise and passions in decorating, gardening, fashion and entertaining. 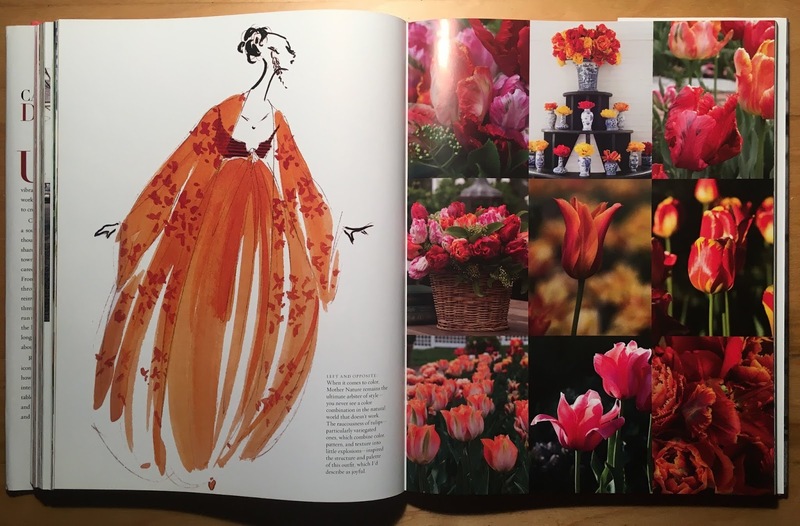 With this book she combines them all and explores how everything she does, from her fashion designs to setting a table to arranging flowers, is inspired by her consistent taste and style - her constant thread. This book is unique too because she writes about her personal life experience. Carolyne Jane Smith grew up in a Missouri farm town and was called Janie Smith until she decided to go by her first name and married Axel Roehm. She later married Henry Kravis, the Wall Street financier, who invested in her designer fashion collection. For ten years at the height of the rollicking 80s the couple were the toast of the town. But in the early 90s came divorce, her decision to close her fashion company and an unsuccessful attempt to start a catalogue business. Carolyne writes that, "there were moments in which I genuinely believed I wouldn't find the strength or the will to continue."